Looking for the best movers in Lake Ridge, Virginia? Then you’re in the right place! Able Moving & Storage has a service area that extends far beyond the local area of Lake Ridge. Our moving services have relocated families and businesses all over the world. You can trust the moving experts at Able to take care of every single detail. We’ve been offering a hands-off solution to moving, storage, and packing for three decades now. During that time, we’ve learned everything there is to know about moving. So whether you plan on relocating to another local neighborhood, or halfway across the country, Able Moving & Storage is the moving company for you. If you’re ready to schedule your move, give us a call. Otherwise, please look around our website for more information! Able Moving & Storage offers both residential and commercial moving services. Founded in 1987, Able has been moving homes and offices for the past 30 years. Over those years, we’ve established ourselves as affordable, dependable, and reliable. The residents of Lake Ridge deserve a moving company that cares about providing quality services at fair prices. Able Moving & Storage is involved with the community, and we are constantly looking for opportunities to give back. If you’re searching for a moving company to take care of your move, give Able Moving & Storage a call. We’ll treat you like family. We have a friendly and helpful in-house representative awaiting your call! Equipped with three warehouses, Able is fully capable of storing your valuables for any amount of time. Whether you need a short term option for a local move or long term storage for an international move, you can trust Able’s storage. Our facilities are temperature controlled and professionally constructed with the sole purpose of storing your belongings. 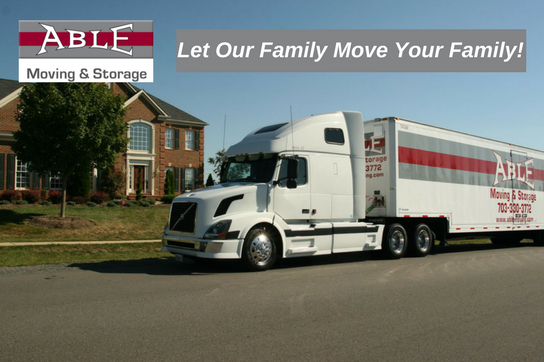 The best storage company for Lake Ridge is only a phone call away. If you’re interested in touring our storage center, call us today to schedule a look around! To inquire about our storage prices, request a free quote! Are you moving to a new location? Packing is the first step in any relocation. If you’re looking for a stress-free, hands off process, use Able’s packing service. Our packers are trained to make quick work of safely packing your items or relocation. When our packers and movers are in your home, you can trust them to treat your valuables with the utmost caution and care. In addition to packing services, we also offer packing supplies. To make moving as simple as possible, we everything you could ever need to complete your move. If you’re looking to self-pack your items, we have all of the necessary supplies to help you get the job done. The total cost of your move gets based on the time it takes, and the number of movers needed to complete your move. The beginning of your move starts the instant our movers arrive at the designated loading location. We promise you a fair quote, with no hidden costs. Once you’ve elected to receive a free moving estimate from us, we will need to contact you and gather additional information to complete your moving quote. We know there are a lot of choices when it comes to movers in Lake Ridge, Virginia, but if you let Able take care of your move, you’ll get the best price and quality movers you deserve. Moving services offered by Able Moving & Storage have the highest quality and standards. Ever since the company was founded back in 1987, we’ve paid particular attention to the quality of service we provide. We are a full-service moving company, which means we offer a whole lot more than just moving. Our service area extends far beyond local; we are Lake Ridge’s moving company of choice for long distance and international moves. Contact us today to schedule your move!